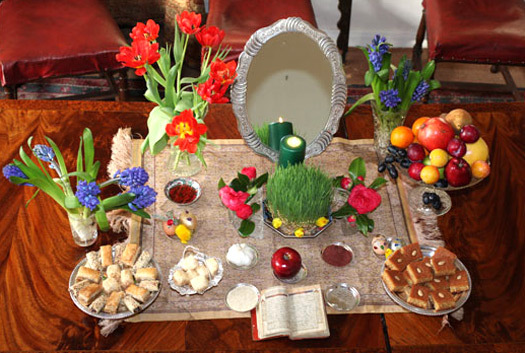 The first day of spring is the first day of the Iranian Nowrooz celebration. Everyone prepares to welcome the new year, cleaning the house, buying new clothes, and preparing to welcome visitors. 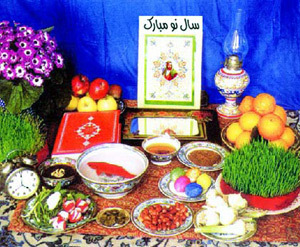 Two weeks before Nowrooz, we plant wheat and barley seeds so the first of the new year will be green. 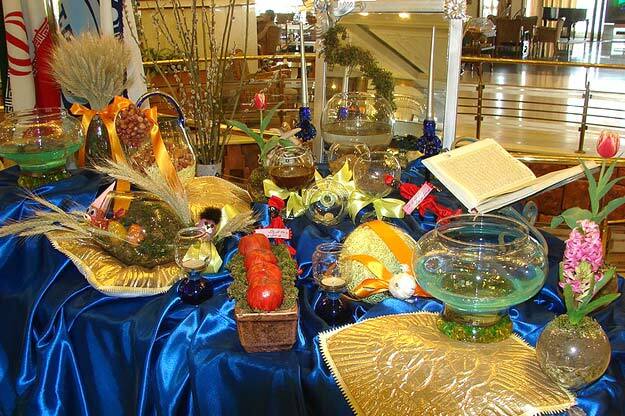 Also to celebrate the new year we put seven "S’s" (seven items beginning with the letter "s") on a table inside the living room area (these seven “S’s” come from a tradition called Haft Son); like sekkeh - coin; sib - apple; sonbol or sab zeh - grass; serkeh - vinegar; senjed - wild olive tree; samano - juice of germinating wheat; sier - garlic, plus eggs, rice, cheese, whole sour oranges and little fishes in a bowl of water, and, importantly, the Qur’an. If it were possible, all of my family would go into this room and sit on the floor around the table, which also held a candle and a mirror, waiting for the change to the new year, observing the seven "S's" and reading prayers from the Qur’an. When the year changed, we congratulated each other and wished happy new year, giving gifts and kisses to one other. After the new year arrived, it was obligatory for us, for 13 days, to see our grandparents and older family members, neighbors and friends and say congratulations to them and wish them health and good luck for the new year. After 13 days of the new year, the barley and wheat grass we had planted was green. We took some of the grass and a live fish and threw these into the river, a ceremony that assured we would be kept safe from all evils. Also on this night we had a custom called qashogh-zany, which means to beat a spoon. Generally, girls, women and men disguised themselves beneath veils and went out into the neighborhood. With their spoons, they made noises on their bowls, hoping their neighbors would throw something in the bowl such as money or food or candy. Receiving the gift meant that our problems were gone, and thanks was given to God. This was night full of ceremonies. Another ceremony was called fal goosh, a receiving of an omen by listening. Still veiled and thus disguised, people would listen to what others were saying. If a passerby said something positive, the listener felt something positive would happen to him too. If the passerby said something negative, the listener might feel something bad would happen. Unmarried girls especially would listen, to see if the talk indicated they might soon be happily married. One week before Nowrooz, somebody would appear in the neighborhood who looked like a Santa Claus wearing red clothes and long beard, with a blackened face, carrying a tambourine in one hand. He sang and danced, telling people the good news that Nowrooz and spring would come soon and they should be happy. Older people told the children that the earth, the terrestrial globe, was sitting above a cow’s horn. As the old year ended, the cow tired, and so at the first of spring the cow bent his head and transferred the terrestrial globe from one horn to another. At that time the fish who had been swimming in a bowl with the sour oranges was resting, so the water wasn’t moving. When the cow transferred the terrestrial globe from one horn to another, the fish and the sour oranges would move and that was sign that the year had changed.